Prologue: three weeks ago, on 8/3/2010 John Cassali phoned my bookshop at 2:40PM and threatened that if I didn’t stop “demonizing” him he would throw all garbage he collects in the front of my bookshop. I told him I had no idea what he was talking about; he referenced letters in the local papers (not written by me, nor with my preknowledge) and hung up. I was shaken by this call, because John seemed capable of violence. Yesterday my partner Paul Encimer and I were approached by some of the street population who informed us that homeless encampments had been raided, tents slashed, and things taken. We were asked for help in getting the survival gear—sleeping bags, tents, clothing, blankets, crutches, shoes, food, and other items to safety before these items were taken to the landfill. Guided by community members, Paul went and filled our truck with these needful things. We put word out to the community that we would keep these things safe. Today at around noon John Cassali pulled up in his white truck and dumped 10 bags of garbage [17 bags in all, 7 of them containing survival gear] in front of our shop. We went out to ask him what he was doing; he was very angry and swore and said that Paul had scattered garbage (not true) and therefore all the garbage was ours to keep. Paul and he exchanged words, Cassali drove away. Paul called the sheriff’s department, and after a time Officers Zeck and Ireland appeared. Ireland is usually in Eureka; Zeck says he is here at the SoHum substation during the week. They had been contacted by Cassali before receiving our call. We explained our situation and I informed the officers of the previous threat. Zeck phoned Cassali and tried very hard to frame everything in the “everyone desires the best for the community” mode. I spoke to the officers about why they were not taking property to the substation instead of to the landfill. We showed the officers the retrieved survival gear. Cassali was asked by the officers to come back and remove the bags of garbage. At 12:51pm he returned and filled his truck, staying to chat with a friend at our steps for a few moments before driving away. I declare this to be a true statement of these events; I have typed this myself. October 2008: John Cassali, some time ago, started petitions against people who live outside, and he harasses them. John Cassali has been bagging people’s stuff. He has been stealing survival gear. John broke the law by taking people’s stuff after the sheriffs did their sweeps- by coming behind the sheriffs and taking people’s possessions to the landfill.The people’s DUE PROCESS has been violated. February 22, 2010: John Cassali steals and dumps peoples’ camps with the Sheriff’s complicity, assistance, blessing. POP…it’s a crime, just following orders! Read this…this is just one page…. END THE WAR ON THE POOR! Every Tuesday gather in solidarity and strength. END THE WAR ON THE POOR. “The difference between us and law enforcement is we have the ability to come out on a daily basis,” Shelter said. Shelter and his team of North Coast Resource Center — or NCRC — volunteers spent about three to four hours Friday morning cleaning up the marsh near the Virgo Street entrance as part of a new program funded by a $20,000 grant from the California State Coastal Conservancy. The center signed a contract with the city of Eureka on Tuesday and began surveying the area Wednesday. Part of the program’s mission is not just to kick people out of the marsh, but educate them about taking responsibility for the environment they disturb and other options they may have. 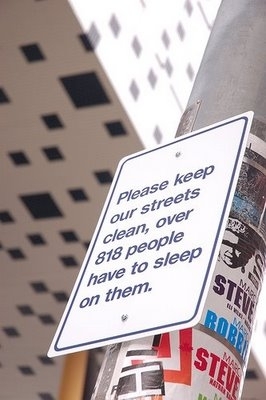 ….During a pilot program in Trinidad, Shelter said occupants of 124 of the 182 encampments did not want to be there. He hopes that cleaning the marsh will also allow the program to gather data about the demographics of the homeless community. ….A lot of people don’t realize that if they leave garbage outside of their house — like old mattresses, blankets, or carpets — they are providing the homeless with materials to build makeshift shelters, he said, standing by a campground consisting only of a blanket and what looked like a wooden platform. 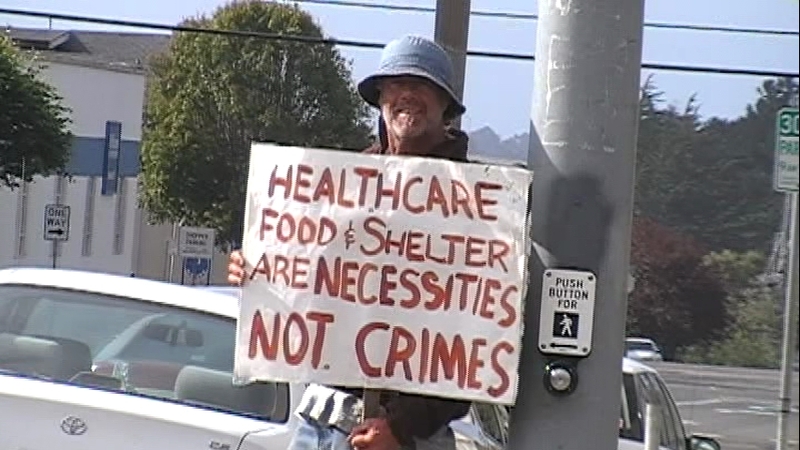 ….At least twice a week, he said, officers sweep homeless camps. But without any place to move to, the camp’s residents are forced to find another space to set up camp. ”We just keep moving them around,” Harpham said. ….After a complaint is issued, Harpham said Eureka officers respond to tell the trespassers to leave. Their information is reviewed in a database, and if they are repeat offenders [repeat sleepers! ], they are either arrested or cited. There are some, perhaps many,who think ill of the poor; some who view homeless as criminals – criminals that invade our pristine neighborhoods. It appears a fact that some care about the plight of others, and there are those who appear not to care much if at all. maintenance department and asked that they be shut off and they were shut off. I write this letter just to draw awarness to the predicament. We ask; do we have our hearts in a good place. Do we care about the plight of those less fortunate or do we see them meanly as some intrusion into our space. Perhaps we should give this subject further thought. Specifically we might question in what direction is the economy of working classes heading and not just in Humboldt County. The cops have been slashing tents and terrorizing people with night raids. Rodrigo Reyna-Sanchez, holding a machete, and 4 other cops have been out since Wednesday are the reports I’m getting from folks. We don’t have all the info yet; A friend has gone to see if he can help people get their gear safely away. We have reports of destruction of property by the police who are slashing tents and bagging camps in the Redway/Garberville area. Also reports that people are being told they can’t go back to their sleeping places or they will be arrested. Hamilton seems to be the deputy in charge at the moment. McCall is the other one according to my informants.